Prof. Dr. med. Jörg Otto Schwab diagnoses and treats disorders of the cardiovascular system. One area of focus is the diagnosis and treatment of cardiac arrhythmias, including telemonitoring (remote diagnostics and monitoring), as well as their catheter-directed treatment (ablation). In addition, the experienced cardiologist implants cardiac pacemakers as well as implantable cardioverter defibrillators (ICDs), and he carries out patient aftercare. If necessary, Prof. Schwab makes use of magnetic resonance imaging for diagnostic purposes; the technology is also used for special, functional examinations of the heart. A unique feature of his treatment is his close cooperation with the Beta Klinik radiology department, which makes extensive MRI examinations possible for patients with cardiac pacemakers or ICDs. 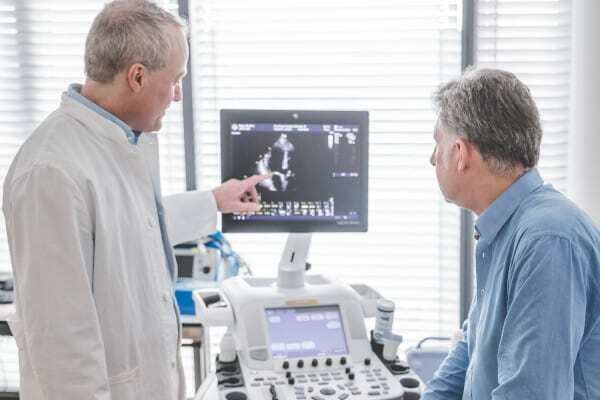 In order to prevent heart attacks, Prof. Schwab’s cardiology team relies on comprehensive diagnostics and treatment of cardiac insufficiency, including catheter examination for the removal of coronary artery constriction. In cases of severe congestive heart failure / cardiac insufficiency, detailed advice is given as well as assistance choosing an appropriate form of therapy (usually aided by electrical equipment). Prof. Schwab uses modern examination procedures (e.g., echocardiography, cardiac MRI) in the context of cardiovascular disease prevention. Prof. Schwab is also available at the weekend and can be found in the cardiac emergency room.